A rather intriguing title to a thematic dance recital presented by Savitha Sastry on February 11 at the Chowdiah Memorial Hall, Bangalore, it was a unique presentation exploring the dichotomy of life and death structured on the imagery and narrative of a story told with the grace and fluidity of classical Bharatanatyam. The narration begins with the mother lulling her child to sleep. Soon the child is taken away in her sleep to heaven by the angel of death. The child awakens to a new and unfamiliar ambience and comes face to face with the lord of death, who proclaims to the child, “This garden is your playground and you are free to roam around.” The child asks, “Why can’t I go back?” “I’m the master here and I decide who comes here, and you cannot go back,” says the lord of death. Perturbed, the child remembers her grandmother saying that if you pray sincerely, you will get what you want. The child is seen in prayer and soon the prayer of an innocent child moves the lord of death to bring the child’s mother to heaven. There is the play of joy as mother and child are united. The child enquires why her father also cannot come to heaven and join them. In a dramatic twist and irony to the narrative, the tenor changes, the lord of death visits the father and asks him to save him from the predicament. The father is seen performing a homam against the background chant of mahamrityunjaya mantra much to the consternation of the child. The child says, “Father should come here. Why is he doing all those rituals?” The narrative ends with a beautiful portrayal of life and death as twin sisters each one unknowing of the other, raising many questions about the philosophy of life and death. Savitha demonstrated her skills of communication with the audience, bringing a new dimension with her innovative concept of this presentation, An accomplished Bharatanatyam dancer with a stately presence on stage, a good sense of line and geometry, footwork and aesthetics, Savitha beautifully portrayed the several roles of mother, child, angel, father and lord of death. The innovative use of props, subtle and evocative, the continuity of the script maintained by voice and the music and lighting enhanced the production values of the performance giving it a sense of elegance and harmony. In the post performance question and answer session, a member of the audience asked whether the story was inspired by the Upanishads or the story of Nachiketa. AK Skrikanth, the author of the script, said the inspiration came from the writer Ben Okri who wrote about the children in Africa. He further added that he is looking forward to writing more scripts of this kind. 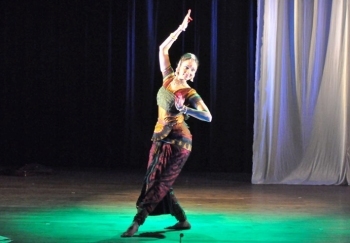 When asked whether this narrative could have been performed as a free flowing contemporary dance , Savitha replied that her forte is Bharatanatyam and she would always like to express it in the language and grammar of that art form to bring alive the sensitivity, creativity, meaning and relevance to her presentation. The performance was embellished by the excellent musical score of Rajkumar Bharati, the lyrics of Niranjan Bharati, the choreography of Renjit Babu Choorakad and Savitha Sastry, the creative lighting of Victor Paulraj to embody the intelligent fusion of movement and joy of expression associated with this presentation. Satish Suri has been an ardent follower of dance and music for more than 40 years, starting with being on the committee of the International Music and Arts Society founded by Vijaya Devi, sister of the Late Maharaja of Mysore, Jayachamarajendra Wodeyar and now presently is treasurer of World Dance Alliance Karnataka Chapter. He has presented several artistes, both dancers and musicians, over the last 40 years.